A starkness and exaggerated verticality lend this village church visual presence. The rural Gothic Revival style is given full play here in the three arches of the façade and the tall pointed windows with their Y tracery. St. Thomas’s was built ca. 1835 to serve the Episcopal congregation of Middletown and was completed by 1837 when Bishop Meade officiated at a confirmation here. Episcopalians, both urban and rural, traditionally have been attentive to the architectural quality of their churches, hence it is not surprising that St. Thomas’s is an effective though provincial interpretation of the Gothic style. 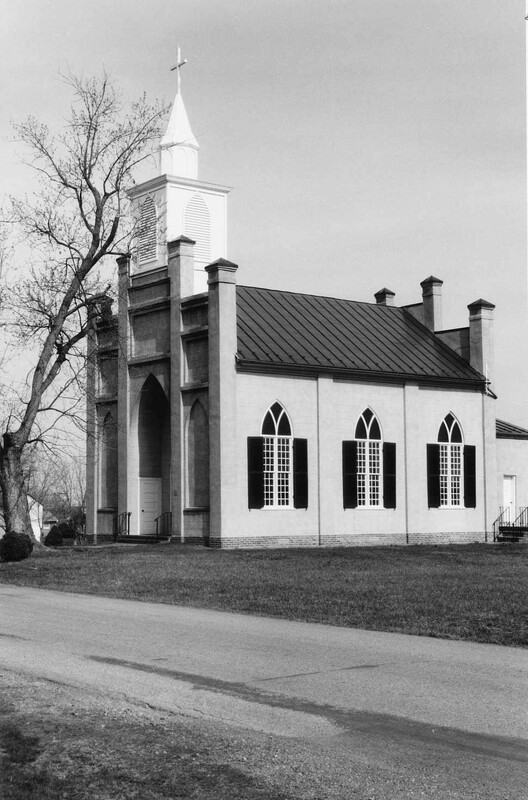 The church was used as a Confederate hospital during the Civil War, and Northern troops used it as a stable. The building was closed in 1930, and in 1966 it was given over to the town of Middletown. It has since been restored for use as an interdenominational chapel.